For graphics, networking, and high performance computing, the latest iteration of high-bandwidth memory (HBM) continues to rise up as a viable contender against conventional DDR, GDDR designs, and other advanced memory architectures such as the Hybrid Memory Cube. 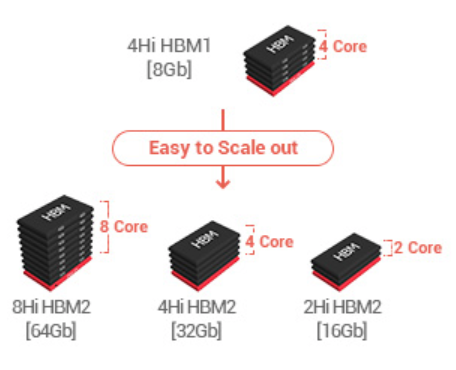 HBM enables lower power consumption per I/O and higher bandwidth memory access with a more condensed form factor, which is enabled by the stacking memory dies directly on top of each other and sharing the same package as an SoC or GPU core using a silicon interposer. Each pin drives a much shorter trace, and runs at a lower frequency, which in turn results in significantly lower switching power. The high bandwidth performance gains are achieved by a very wide I/O parallel interface. HBM1 can deliver 128GB/s, while HBM2 offers 256GB/s maximum bandwidth. Memory capacity is easily scaled by adding more dies to the stack, or adding more stacks to the system-in-package. Companies working with HBM are just starting to report real-world performance numbers. eSilicon has found an 8X bandwidth increase with HBM over other DDR approaches. And Synopsys has found that comparing the relative energy per bit just in the physical interfaces of DDR4 and HBM2 there is a 5X reduction in energy per bit just in the data transfer part. That has prompted a spike in design activity around HBM. According to Frank Ferro, a senior director of product management at Rambus, what’s driving this is the ability to take existing DRAM with 2.5D technology and move it closer to the processor using a fatter data pipe, speeding up data throughput, reducing the amount of power necessary to drive a signal, and cutting RC delay. Also, with the large current draw in a significantly smaller form factor, thermal implications are another key focus area when designing with HBMs. Fig. 2. HBM connected to interposer. Source: Samsung. From designer’s perspective, designing HBM is different than what they’ve done in the past for the stacked structure, said Marc Greenberg, director of product marketing for DDR controller IP at Synopsys. For one thing, HBM is a multi-channel architecture. On top of that, there is a question about how to utilize all of the bandwidth in HBM. Further, fewer signal conditioning techniques need to be used in the HBM interface than in the DDR interface. These techniques take power in the DDR case, and they are just not necessary in the HBM case, he said. When it comes to making the tradeoffs, Lou Ternullo, product marketing group director for memory, storage and interface IP at Cadence reminded that there are typically two knobs that can be turned to increase raw bandwidth. One is the clock frequency — the higher the datarate, the higher the bandwidth. The other is the number of data pins that can be accessed simultaneously. For example, if the system is 32 bits, at the same frequency if you double the number of bits to 64, the bandwidth is effectively doubled; so HBM is actually 1,024 bits — which is significantly wider than any other DRAM in the market today. Despite the advantages, however, design tools are lagging when it comes to HBM. There is no way to extract the interposer properly, so commercial tools are used to model inductive effects. There are new tools on the way, but design teams have gone back to using traditional field solvers to get the true R&C characteristics of the interposer to attack the extraction challenge, Sabharwal said. The bottom line is that solutions can’t come too soon. Where high-bandwidth memory will be utilized is still unfolding. This is a new technology and its benefits are just beginning to be documented. HBM is finding its way into leading-edge graphics, networking and high-performance computing today. But it also may find a role in deep learning, artificial intelligence, convolutional neural networking, fully autonomous vehicles, and other advanced applications that demand massive bandwidth and low power—particularly as the price of interposers continues to drop and chipmakers build up enough expertise and history working with this new memory type and different architectures and packaging. Experts at the table, part 2: The impact of 2.5D and fan-outs on power and performance, and when this technology will go mainstream. released on 24 June 2015 is impressing me even more now. It is that proof of concept chip that kick started the whole HBM ecosystem.